Fits conveniently in any corner, against the wall, or within a room. Desk height of 23 in. accommodates most children to age 10 or 11. Corners are rounded, desk is built to age appropriate size specifications. 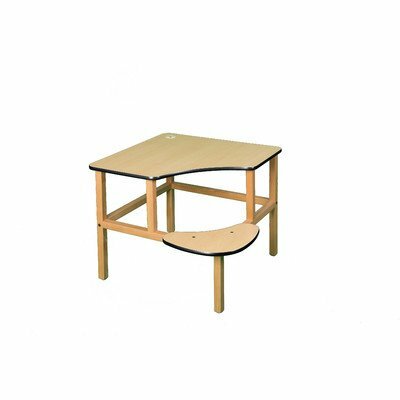 Solid wood legs and sturdy frame, laminated top and dent resistant edge-trim. Attached seat eliminates chair clutter. Desks made in Oregon, utilizing renewable materials from the Pacific North West, shipping cartons are constructed from recycled materials.. All materials used have been tested to confirm that they comply with the requirements set forth in the Consumer Product Safety Improvement Act. Includes a cable grommet in the desktop to keep cords safe and organized. Assembled: 32 in. W x 32 in. D x 23 in. H. Seat: 17.5 in. W x 9 in. D x 12.5 in. H.